The Inbox on the Home page, showing all files that have been routed to you. The Dossier Content in a Dossier, showing all files that are in the Dossier. 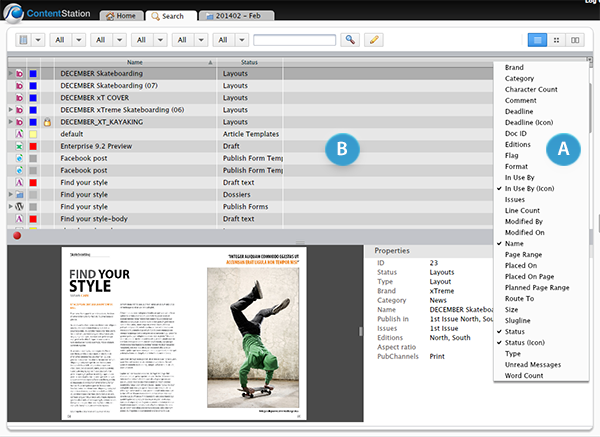 The Search Application, showing all files that have been found. The Trash Can Application, showing all files that have been deleted by users. 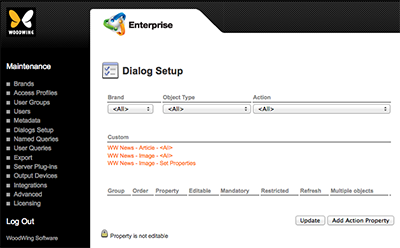 When viewing the Document pane in List View mode, the properties of the file are shown across multiple columns. Columns can be added or removed through the Column List menu. Figure: The Column List menu (A) is used for adding or removing columns from the Document pane (B). Step 2. From the Action list at the top of the page, choose Query Result Columns for Content Station.